These days science is all over bird migration. We watch our screens avidly waiting for the next ping to appear on a Google map as a satellite-tracked individual heads on its path in a dot-to-dot manner. But, whilst we can see its chosen path to the final destination and back again, the individual in question is nothing more than a point of light on a computer screen until it is back proclaiming its territory closer to home. To me there is a void in this information; we can’t fully appreciate just what an individual bird does during these phenomenal migrations, the hardship it endures or the sights it witnesses along its journey. We really can’t sympathise when a Cuckoo hits a dust storm, or a Honey Buzzard is downed by torrential rainfall, as the ping on the map gives none of this information, just a time and a place. 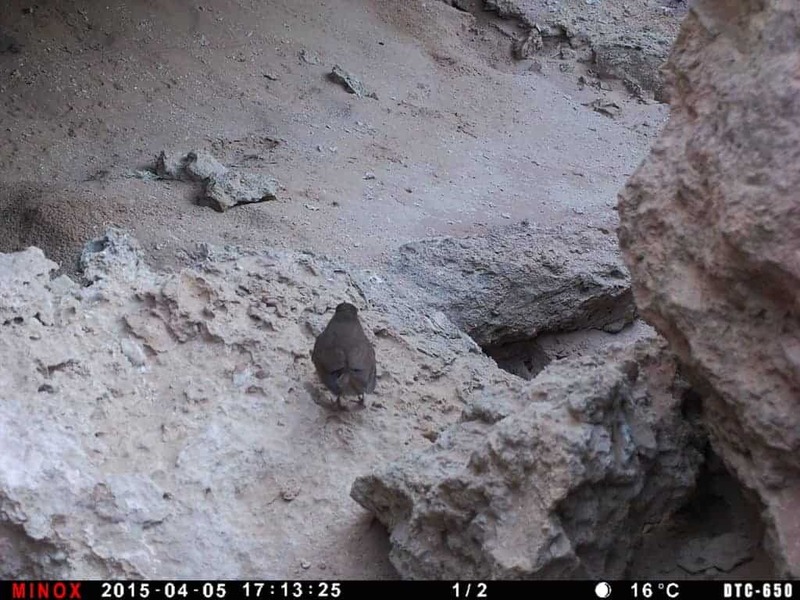 How do birds such as this Bonelli’s Warbler survive their desert crossings? 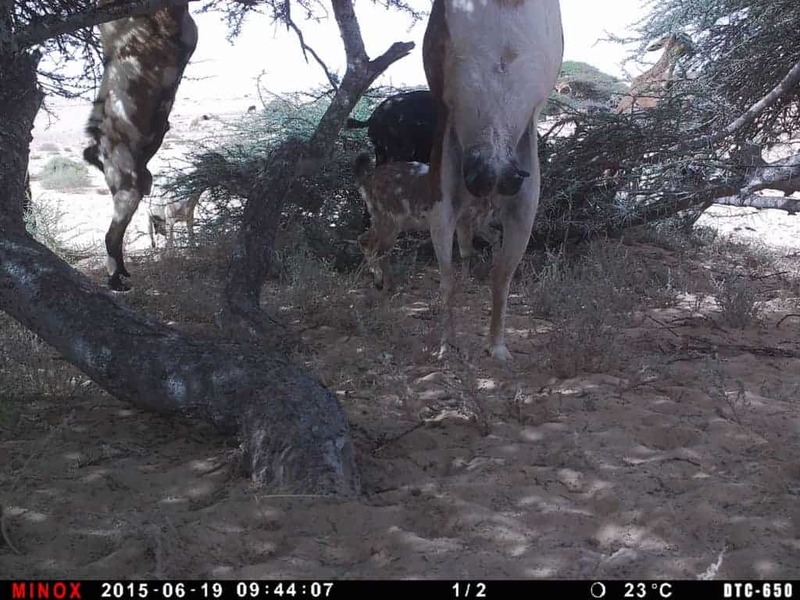 Last year our eyes were opened to a whole new world in the Sahara, one which I had not fully appreciated until the accidental enlightenment by our camera traps. 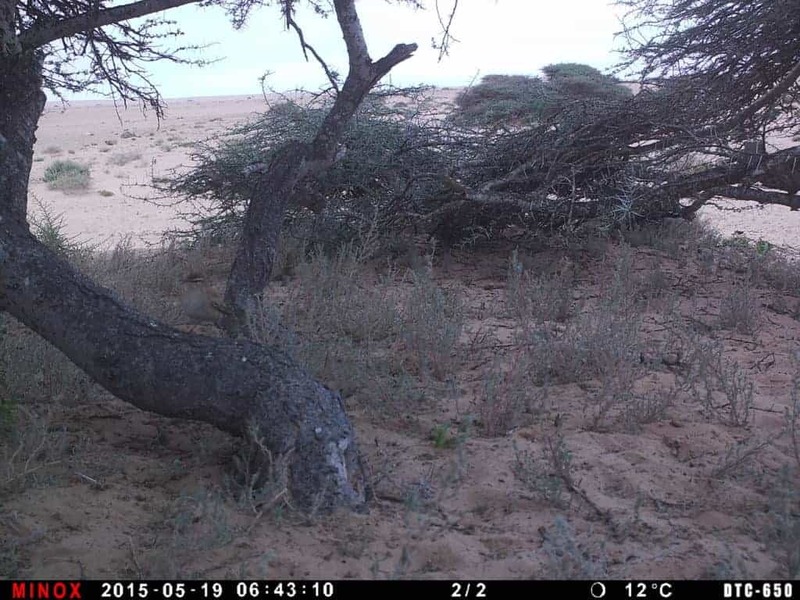 We had set up a number of cameras along the Aousserd road, Atlantic Sahara, to monitor mammals in the region. 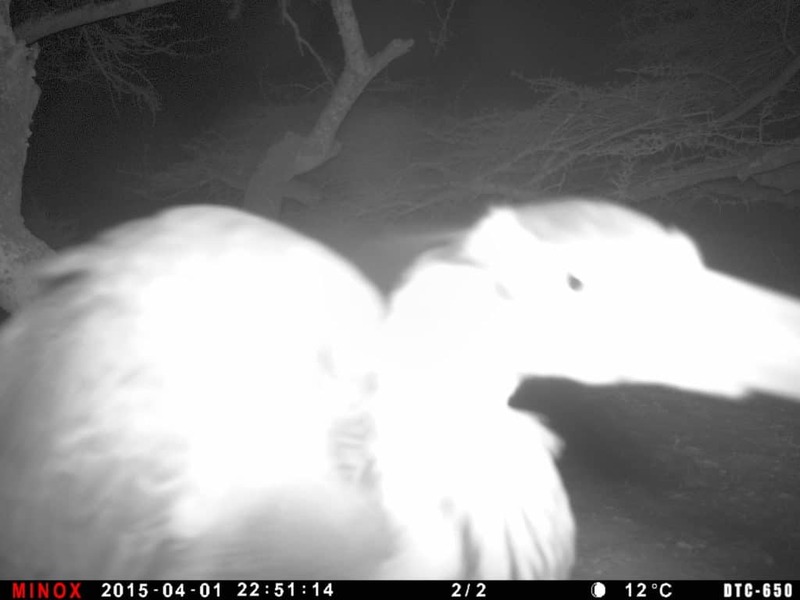 Our cameras were deliberately biased to different habitats to try and maximise the number of mammal species we recorded. Along the northern section of the road, wind-blown sand gathers around the bases of stunted acacia trees forming semi-stable dunes with just the canopy and a few branches exposed. This is brilliant habitat for Sand Cats and we wanted to try and document one on a camera trap. Stunted by wind and shrouded in sand only the canopies of these acacias are on show. Fast-forward 12 months and we returned with great apprehension and enthusiasm, and thankfully the camera was still in-situ though not facing its original direction. The card was duly downloaded and a quick flick through the first of the images proved quite a shock… a Purple Heron! In the middle of an acacia tree in the middle of the Sahara in the middle of the night! A grounded migrant, clearly, and certainly not what we were expecting! Slowly we sifted through the images. Some appeared to have been triggered falsely but close inspection revealed the tiniest of movements of passerine migrants. 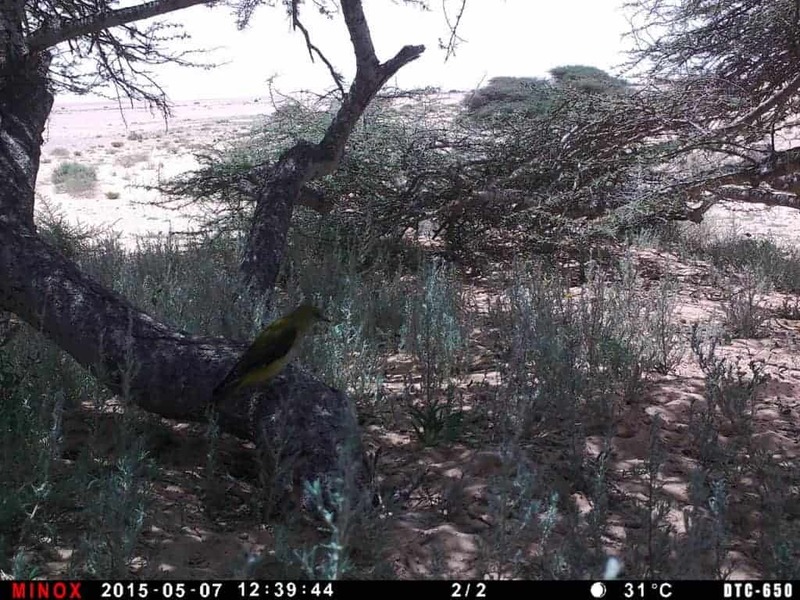 Our camera had caught snapshots in the incredible northward migration of a range of bird species. A Redstart, a Pied Flycatcher, Willow, Western Bonelli’s and Wood Warblers, Rufous Bush Chats and Golden Orioles, Melodious and Olivaceous Warblers, Wryneck and Hoopoe, the list extended to no less than fourteen species between deployment on 29th March and 19th June when it was discovered and dislodged by a goat herder! And this was just one relatively isolated bush! 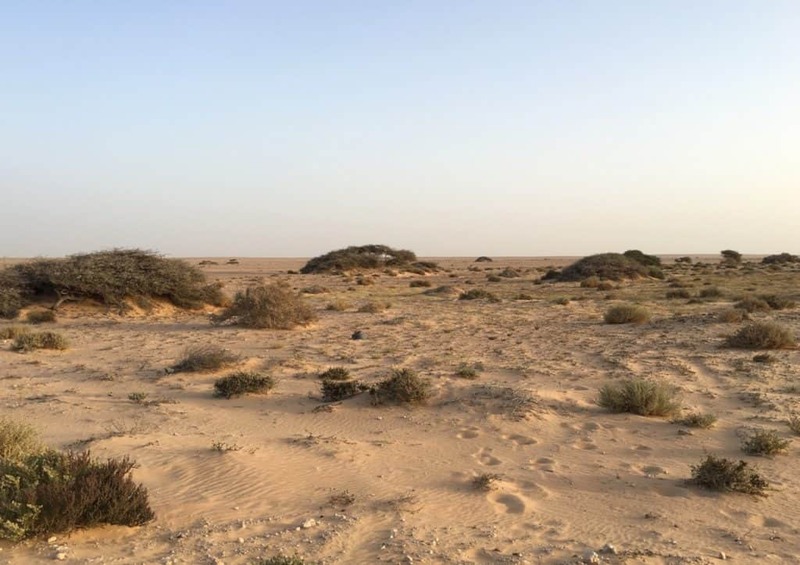 For us it put a whole new significance on these individual islands of refuge in the desert. 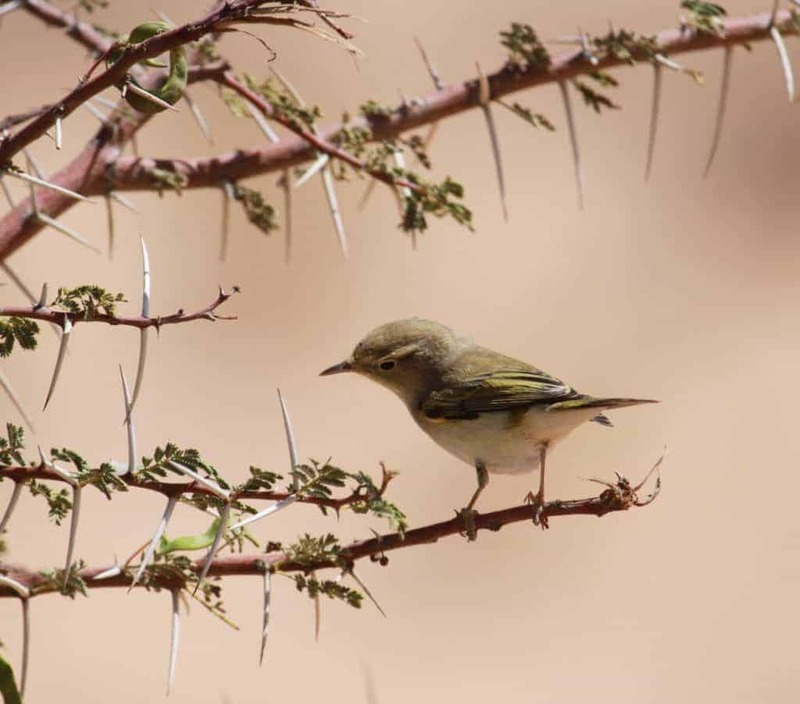 They look non-descript and inhospitable, with their inch-long thorns and general lack of vegetation, yet they provide shelter, protection and food, at least for a short stopover. I’m sure that each individual bird would like to drop into an oasis of plenty, however the reality is clearly far from that ideal. Some of our other cameras captured migrants in very different scenarios. 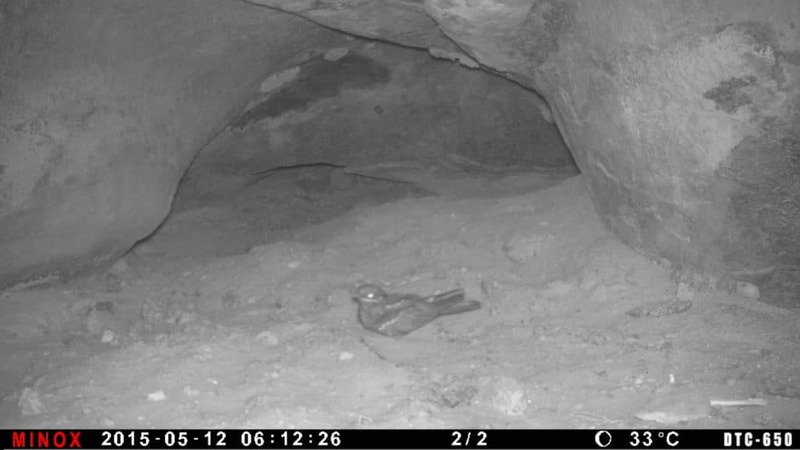 Caves provide shade in which we recorded species such as Reed Warblers, Whitethroat and Nightingale, whilst one even hosted a European Nightjar for a couple of evenings. Whilst only snapshots of activity, the images provide extra pieces in the phenomenal jigsaw that is understanding bird migration. The next time you look at a Willow Warbler try and picture some of the amazing places it will have fed and roosted over the previous few months. Previous ArticleOrnithologists - Exciting opportunities abroad await!